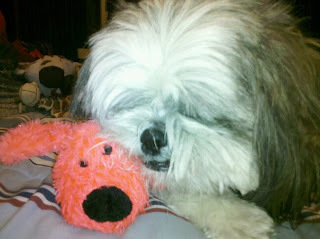 Here is my sweet Ringo using his toy as a pillow. He is so funny I am really happy that I have my two sweet babies to keep me happy. Looks like Ringo needs a hair cut though. I was at the thrift store on Friday last week and was looking for some sea shells to add to the Picture frames that we made last week and I stumbled across this great find. I am not sure what I am going to do with them yet......any ideas? I thought maybe I could do a mosaic or a picture of some sort....hum not really sure yet but I bet I can find a great idea on pintrest! There is a lake at the base of a group of mountains. On the edge of that lake is a boat dock that is long and large but being very well weathered by the many seasons that have visited the lake for some years. 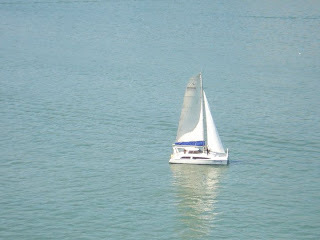 Sitting on that lake is a small white sail boat drifting here and there with the gentle winds that softly push it around the lake. Beyond the boat dock is a small gravel path that being over grown with the wild flowers leads up to the small bench half way up the hill so walkers may take respite for moments while at the same time gazing out over the beauty of the lake. On the bench sits a robin hoping back and forth in the gentle sun pecking here and there. My husband is a big chocoholic and often when I clean up the room I find small wrappers in the funniest places so when I was making the bed the other morning I found this. It was under his pillow and it was so surprising that I had to laugh! A Content housewife blog site. I loved this idea so much that I called my mother and sisters and said that we have to do this so I had everyone gather up the supplies and here is what we all came up with. Then before I framed it I took everything out and on one corner I taped the edges and then sprayed it with some car trim adhesive that my husband had in the garage and then plastered it with some clean sand I had left over from another project. I love the people in this picture. They all are gone now, they all passed the last few years and none of them old enough to go yet. My Uncle Jim being the one on the right just passing last month. 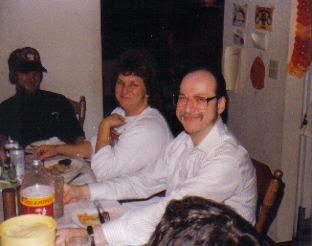 In this picture are my two uncles and an aunt. all of them under sixty. Grrrrr This is the part of life that I could do without..... losing loved ones. Uncle Frank on the left was always the cool uncle. He was about eleven years or so older than me and could make you laugh easily. Then next to him is Aunt Amy, she had polio but was one of the sweetest persons that you could know sweet as apple pie. I.........Love to cook! and I love homemade bread. I got up one Saturday and had decided that I was going to make some bread that day so I got out all of the ingredients and thought to my self that I would make my own flour as well that way I have a nutrient packed loaf. So I pulled out my hand mill and started cranking. I was having so much fun.......for about the first two of the next four hours lol then my arm started hurting. Next came the mixing and the kneading and then the rise, all of that took about another two hours for both. I got this really great gift from my son for Christmas and I have had so much fun with it. At first it was hard to stir until I became familiar with the levers and now I can take off and land with not to much problem. My son purchased a large one for himself and my other son has one also and it is so much fun flying them together in the same room. There is a lot of crashing into each other but it is still fun! 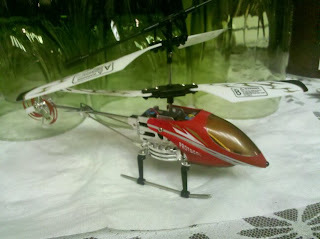 I placed the helicopter next to my drinking glasses for a size comparison as you can see it is small. I can hold it in the palm of my hand but I love it a lot! I made this emergency heater last week for my earth quake kit for when the electricity goes out and I am freezing. It is really easy and very basic. Step three, light the alcohol and it will warm you up. You can use these in your cars too but make sure to leave one window cracked as there is a tiny amount of carbon monoxide. My sweet Kota got a bath and a trim today. He is starting to be more calm as time goes by but he is still a hyper little man. He and Ringo loves to play races around the front room, it is a lot of fun to watch. I love to blog surf and I came across this blog that I really love it's called "Then she made" She is fun and I love this idea that she came up with called "The Nativity experience" I am SOOOOO doing this!!!!! I love the idea and the thought of making someone happy with out knowledge of whom surprised them is so much fun for me. I love to see the joy of people being surprised because it brings me joy to see theirs. I may post the pictures later of the Nativity that I purchase.